We are Contract Window Cleaning Specialists, serving the Commercial and Public Sector. We clean all types of buildings and we are fully insured to clean up to any height, utilising a variety of innovative access methods. At Ryemead, we are proud to hold many industry accreditations that include the highly respected Safe Contractor Scheme and the world-renowned ISO 9001:2015 Quality Assurance System. Your Windows, Our Passion! 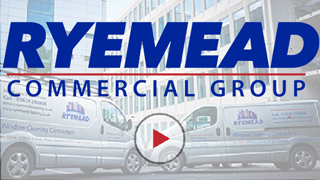 Ryemead has many years experience of Exterior Building Cleaning to ensure that your buildings project and endorse your core company values. We clean every type of external building material using only the best equipment and techniques. Our services cover everything from Brick Cleaning and Façade and Cladding Cleaning to Graffiti Removal and Stone Cleaning. We breathe new life into any building. We are immensely passionate about what we do and we strive to ensure full client satisfaction, service delivery and most importantly safety. As a company we have worked hard to build up a reputation for providing the highest level of service for our clients, utilising advanced equipment to cater for all types of cleaning, with a tailored approach to our clients requirements. It’s a miracle! Looks fabulous. Thank you. I have to say, very impressed with the window cleaning. Our Facade and Cladding Cleaning division clean every type of external building material using only the best equipment and techniques. Our tried and trusted methods include pressure washing, hand scrubbing and hot steam cleaning, guaranteed to breathe new life into any building. Our flexible hours pressure cleaning service utilises industrial jet equipment for all areas from car parks and office entrances to shopping centre walkways and brickwork to remove weathered, dirty and unsightly areas. Following an extensive tender process, Ryemead Commercial Cleaning was chosen as the main contractor to provide window and cladding cleaning services to Reading Railway Station, a £897 million refurbishment project which was opened by Her Majesty Queen Elizabeth II in July 2014. In November 2017, as lead contractors, we carried out the project ensuring the safety of passengers and railway staff and with a focus on minimal disruption to the operation of the station.